Who doesn’t love all things salted caramel? Today I am sharing this Salted Caramel Vegan Cheesecake. Super decadent, yet made from whole food ingredients! This Salted Caramel Vegan Cheesecake is super rich, so a small amount will satisfy you. I made the cheesecake a vanilla flavor, then topped it with the salted caramel. I added the chips because chocolate makes everything better right? If you like this, you may also like my maple cinnamon vegan cheesecake or my chocolate raspberry cheesecake. 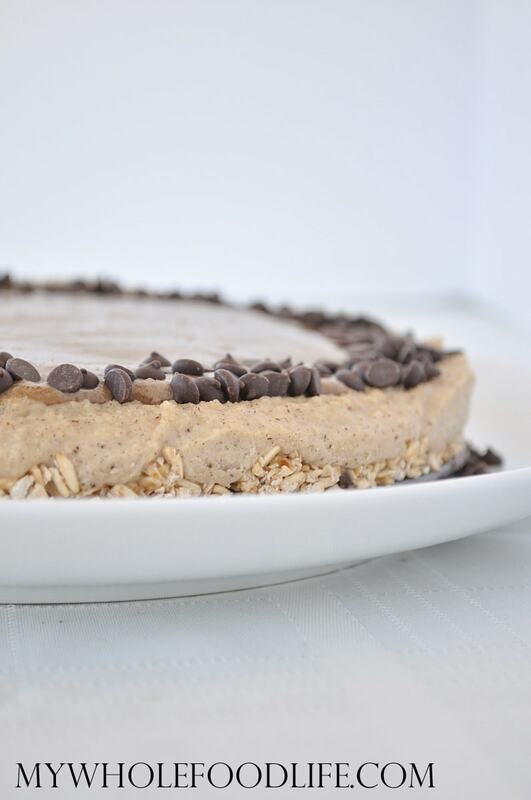 This cheesecake recipe is vegan and gluten free. You could probably make it grain free as well if you used nuts in place of oats. I made a large cheesecake, but you could also do mini cheesecakes if you like. In a food processor , combine the crust ingredients. Press mixture into a greased spring form pan . If you don't have a spring form pan, you can mini cheesecakes by pressing the mixture into lined muffin cups . Stick in the fridge to firm up. While the crust is in the fridge, drain and rinse the cashews. Add them to the food processor with the rest of the cheesecake ingredients. Blend until smooth. Pour the cheesecake mixture on top of the crust and stick in the fridge for at least an hour. Once the cheesecake is semi set up, add the salted vegan sweetened condensed milk. Note: It may take chilling overnight to get the cheesecake to completely firm up. This should last a couple weeks in the fridge. Enjoy! The cheesecake looks so yummy! This looks delicious!! Thanks for the great recipe! I've never had anything salted caramel, even before I went vegan. Now though, being 22 days in to this vegan adventure I am craving all sorts of sweets and chocolates and salt. I think I'll have to give this one a try. Can vanilla extract be used instead of the ground vanilla beans or would that change the texture too much? You can use it, but it may taste a little like alcohol since this is a raw dessert. Thank you for using maple syrup instead of stevia or honey. It seems like so many raw, vegan, paleo, etc desserts use both of those sweeteners and I can not have either. Just started this adventure of a new way of eating and finding sweets to satisfy my family that I can also enjoy has been a challenge . Thanks again, can't wait to try it. I cooked the sweetened condensed milk down into a caramel and then added it to the top. Could I sub almond meal for flax meal? Thanks! Thanks. The Dr. said "NO SEEDS" and flax meal comes from flax seeds, so figured I better be very cautious. There is a cashew allergy on my family, do you have a possible substitution? Saw as it was going through that my email address was incorrect. You may be able to use macadamia nuts too.